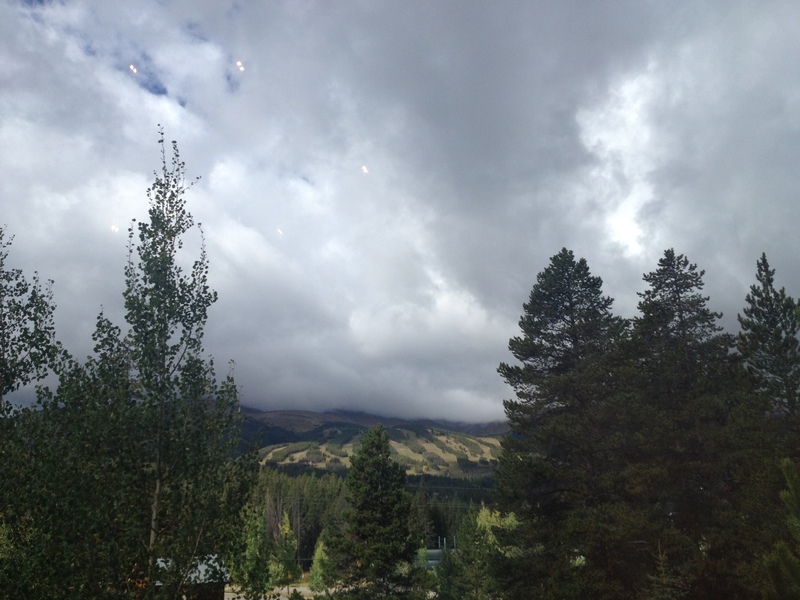 I’m back in Breckenridge, this time for a Writing Away Retreat, which I agreed to do a couple of years ago. Funny. It’s again the slow season. The gondola to the slopes is closed, and mostly the tourists are elderly, stopping to shoot a photo of the river. I walked five miles in the autumn sunshine, feeling all the stress of the past couple of weeks drop away, and last night slept like a five-year-old. I keep looping back here. It’s a tourist town, plain and simple. The streets rare filled with milling out of towers all the time, winter, summer, spring, even now on this off-midweek in September. So why do I like it so much? I don’t even (downhill) ski. We’ve been looking for a long time for the place where we might have a little condo or cabin or something. Both CR and I love to be in the high mountains. I love to hike, and he loves to run, and I’m just a mountain girl. I find it healing to be in the thin air, amid the trees and on the lakes. He just loves altitude. The more the better. At 10,000 feet, he starts to talk. At 11,000, he’s positively chatty. We visited a lot of places. There are some that are just too glitzy. Some that are too small or far away or backward or ridiculously expensive. We were enamored for awhile with Buena Vista, which is not far away from Breckenridge. There are hot springs, and it’s quiet, away from the tourist hordes, and there is a big hiking area that both of us like–he for orienteering, me for, well, hiking. Also, the views of Mount Princeton are amazing. It’s one of my favorite mountains in the state. But Buena Vista is quiet. REALLY quiet. I finally nixed it, and that was when CR cast his net another direction. We ambled into Breckenridge one summer afternoon and there was an art fair. I bought a small painting, and we looked at glass, and ate at decent cafe and walked around with the HORDES of tourists and I thought, “Hmmm.” I never mind a tourist town. I grew up in one. The thing is, I love the mountains, but I don’t love really small towns. I spent a lot of time in Sedalia and CAstle Rock when I was a kid, and it was just….boring. (For locals, I know it is hard to imagine a Castle Rock that was a small town, but trust me, it was tiny and boring.) I also don’t want a place that’s as glitzy and monied as Aspen or Vail. Breck is absolutely nothing but a ski and outdoor-lure town, but that’s kinda what makes it possible to consider actually spending lots of time here. There is a ton of hiking and running, and in ten minutes, you can be in the serious backwoods. There’s a giant lake not far down the road, where we could kayak in summer. My kids could come ski (neither of us downhill ski). There are some good restaurants, and a movie theater down the road in Frisco, and a long, long, long bike path and the mountains are IN YOUR FACE in every direction. And I can drive here in two hours, on my own. Maybe not in the wintertime on my own, but that’s not the season I care about. I like the others. Happy to find the spot! Even better, CR loves this place. If you could have a second home or a retreat anywhere you liked, where would you choose? I am pretty sure I’ve talked about Gretchen Rubin’s book, The Happiness Project before. The book is upbeat, illuminating, and surprisingly practical. One of the steps I love most is her approach to creating a map of living. Each of us have a different set of goals, a dharma and purpose unlike that of anyone else. It’s helpful to put that down in writing. These are my 12 personal commandments, which are connected to the secrets of adulthood. I used Rubin’s list as a model, but adapted them to me and my reality. Maybe you have a list of your own you’d like to share. This is taken directly from Rubin. It reminds me to be ME, not some idealized version of me. Or as my old Unity minister used to say, “I am God expressing as….Barbara.” Which is an exhilarating thought, really. Never as easy as I think it will be. For example, when I am driving and some rude driver cuts me off, how can I be happy? But I can, as my friend Heather does, tell myself another story about the action. Maybe that person has a sick child or is rushing to the beside of his best friend. This also counts when I am irritated with some aspect of daily life or a person in my life….100% means all the time. The weird thing is, this particular secret carries a huge amount of relief. 3. If I look good, I feel good. Simple. I don’t have to have sparkling clean floors, but need to reduce visual clutter as much as possible. I need daily walks and fresh air and lots of hard, physical exercise. I am grouchy without it. If I’m cranky or overwhelmed or tired, I almost always need to get outside or go swimming or go work out. The deeper the grumpiness, the more I need to do. I am a morning person. Like, obnoxiously so. I like to wake up early and get going on the day. That means I’m genuinely tired and ready to quit by 8 or 9. Because I grew up with vampires, I sometimes feel sheepish about this and will often try to stay up until 11, like other people. All this does is make me tired. Going to bed with a good book at 9 is a great choice for me. Just what it says. Too much sugar or wine, too many video games, too many cookies…and I don’t feel great. I am lucky enough to adore the work I do. Sometimes, however, I can procrastinate myself into a corner and then I have to work too hard to be able to enjoy the process. Much much better to set reasonable goals and show up every day to get the work done. I feel so much better this way. I am a born diarist, and seeing my day to day habits in black and white makes me aware of what habits and actions actually form the basis of my life. That allows me to be accountable and to make changes if I so desire. Everyone likes to be noticed, honored, get presents and cards. I like meditation, but I am surprised how often I’ll say to myself, “I don’t have time this morning.” Making time makes a difference. Our society revers youth, not elders, but we need our elders to guide and help lead. To be the Wise Woman I hope to be one day, I have to learn what that means, and how to embrace it. That means listening to my elders instead of dismissing them. It means seeking instruction and guidance. It means practicing awareness of what I say and how I say it and how that influences others. How about you? Can you think of some things you’d put on your list? I remember early in my career waiting for some check or another that was not arriving in a timely manner, or maybe it was a possible royalty check and I didn’t know how much it would be, and I was trying to affirm it arriving before some need became too intense. My sister, who was at the time a mortgage banker, said, "I just don’t know how you live like that." Often, a writer’s life is financially…mmmm….unpredictable. Learning to live with that is part of the challenge of choosing this path. Affirmations make a difference. Don’t ask me why. I have no idea. But they help. They work. At the very worst, they make us feel better. Money comes to me now in expected and unexpected ways. Write it ten times, five days in a row. Here is an easy, cheerful affirmation for a Tuesday morning: I believe in brilliant surprises. I believe in brilliant surprises.